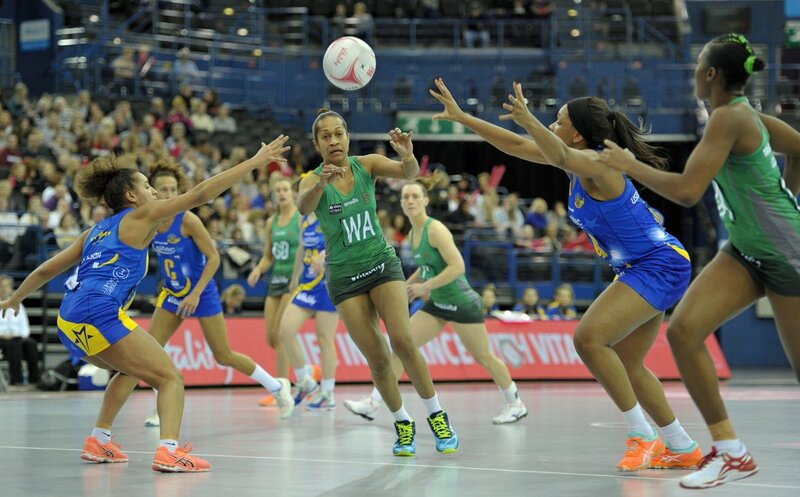 Ellie Nawele in action for Celtic Dragons. Ellie Nawele and Dee Bolakoro are battling for World Cup places when they play for Celtic Dragons in Vitality Netball Superleague matches. Both players are in the provisional 23-strong Fijian Pearls squad named by Australian coach Vicki Wilson and are on course to represent their county during the World Cup in Liverpool during July. Wilson is in regular contact with Dragons’ Kiwi coach Tania Hoffman to check on the form of Nawele and Bolakoro – and the two British Army soldiers are intent on producing their best form for the Welsh team. “They play at the highest level of competition for Celtic Dragons in Superleague in Britain,” says Wilson. “Ellie and Dee are in a high performance environment and working extremely hard. Celtic Dragons Goal-Defence Dee Bolakoro. Hoffman’s Dragons are on their way north today (Friday) for their Superleague clash with Strathclyde Sirens in Glasgow, aiming to secure their second win of the season. Sergeant Nawele, from the village of Nakawakawa in Wainunu, Bua has been in the British Army for 15 years and is attached to parachute regiment. In the latest edition of SoldierSport magazine, Nawele and Bolakoro are interviewed about their netball ambitions. Celtic Dragons’ Wing-Attack Ellie Nawele. “I feel honoured and blessed to be selected among 23 players in the Fiji squad,” said Nawele, a shooter for the Army team who has been converted to Wing-Attack by Dragons coach Hoffman. “We have six shooters on the team already, so I’ve been moved to a different role. At first I thought I would struggle to cope because it is such a fast area of the court, but by playing there I’ve learned so much. “Being in the Dragons team has been a real step up for me in terms of fitness. I’ve had to work really hard as the pace is so fast and was doing extra physical sessions at 6am to ensure I was up to speed. Royal Engineers’ Lance Corporal Adi Bolakoro, nicknamed Dee by team-mates and friends, followed Hoffman to the Dragons from Surrey Storm for this season. “Training has been tremendous,” said Bolakoro. “It is so intensive but, an amazing experience. Bolakoro played for Fiji at the 2017 Netball Europe Open Championship in Cardiff. Fiji are among 16 teams who will compete for netball’s biggest prize when the Netball World Cup 2019 is played in Liverpool during July. Commonwealth Games gold medallists England are second seeds for the tournament at Echo Arena, Liverpool. The Roses will face stiff competition from Australia and New Zealand, as well as other top teams South Africa and Jamaica, as they look to make more history by winning their first World Cup on home soil. Northern Ireland, Scotland, Malawi, Uganda, Zimbabwe, Samoa, Barbados, Trinidad and Tobago, Singapore and Sri Lanka complete the line-up. Dragons’ team includes Jamaican international Stacian Facey plus T&T shooter Kalifa McCollin. The final Fiji World Cup squad is expected to be announced in May ahead of the tournament in July. Saturday 9: Severn Stars v Manchester Thunder (6pm), London Pulse v Surry Storm (7pm). Monday 11: Wasps v Saracens Mavericks (7pm, being television live on SkySports).